This article is written by Mr. Biman Baruah from Sivasagar, Assam, India. I would like to call the 31st of July as “Mohd Rafi’s day” to commemorate the great work this singing legend has done for the musical film world! This article is by Mr. Souvik Chatterji, Master of Law from Warwick University, Coventry, UK. Master of Law from Case Western Reserve University, Cleveland, Ohio, USA. This information is shared by Mr. Binu Nair – founder: The Rafi foundation. +91-98332-50701. 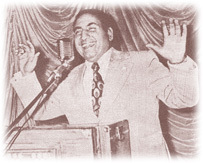 You are currently browsing the Rafians tribute to a true Maestro – Mohd Rafi weblog archives for July, 2007 .